I am a COACH and I want to pay the registration fees for my divers in a meet. How do I do that? In order to pay the registration fees for one or more of your divers you need to visit your Dashboard. From the Dashboard screen you need to locate the meet that you owe registration fees for. If CleanEntries is collecting meet fees for this meet then next to the meet name you will see a little shopping cart icon. If the icon is green then all of your divers have paid their registration fees. If the icon is red then one or more divers have not paid their registration fees yet. Click the icon to be taken to the payment screen. Below the billing and credit card fields there is a listing of all of the charges that are owed by divers from your team(s) for the meet you selected. They are sorted by diver name and event. You can edit this list to remove divers who you do not want to pay for by clicking the icon at the end of the row. This will remove that charge from this purchase. After removing a charge your total amount listed above will be updated automatically. 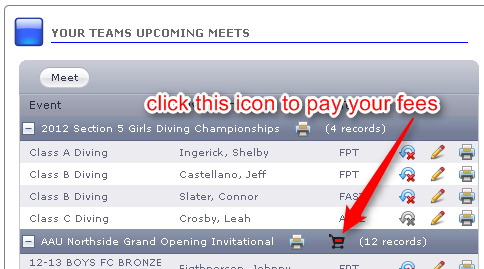 When you have finished updating the list of divers you are paying for please click the Submit Payment button. Please only click the button once. The charge will be processed and if your card is valid you will be taken to the order summary page. 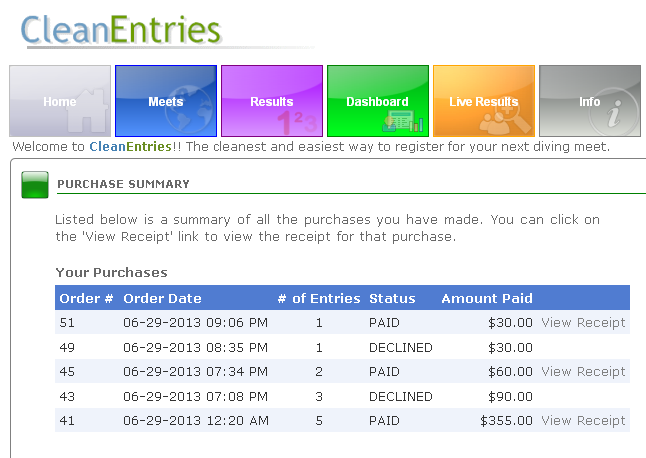 If your card is declined you will see a message appear on this payment page letting you know it was declined.